Enhanced thermal analysis accuracy is critical to meet increasingly demanding design requirements in modern electronics development. Simcenter T3STER and Simcenter Flotherm from Mentor, a Siemens business, is a unique combined test and simulation solution for automatic calibration of semiconductor package thermal models that maximizes simulation accuracy. This helps engineers to better optimize electronics thermal design for reliability, reducing field failures, and to reduce overdesign linked costs. Additionally, the combined solution minimizes traditional manual calibration process time overheads and supports industry supply chain so that semiconductor firms can provide system integrators with accurate, proven transient component thermal models. This offers advantages for electronics thermal design in segments such as automotive, electronics, aerospace, defense, and others. The Simcenter T3STER product is an advanced test solution for thermal characterization of IC packages, power semiconductors, LEDs and systems. It is applied in industry to determine thermal metrics, for heat flow path analysis and in evaluation of semiconductor package thermal structure. Simcenter Flotherm, is the industry leading electronics cooling simulation software family for thermal design modeling from ic package level to PCB, enclosure and full system level. Using the combination of these tools, engineers responsible for thermal design are provided with a unique automatic method for calibrating detailed component thermal models to match thermal measurement data which improves modeling accuracy. Simcenter T3STER test equipment uses an electrical test method to deliver recognized highly accurate, repeatable semiconductor junction temperature time variant measurement that has a 0.01°C temperature resolution & 1 microsecond time resolution. 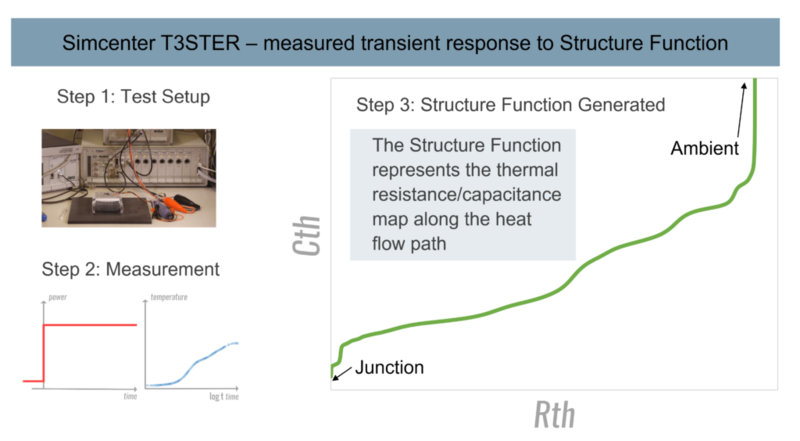 Using Simcenter T3STER a heating or cooling transient response to a power step is precisely measured and post processed to generate a Structure Function, which represents the heat flow path from device junction to ambient as a profile of thermal resistance vs thermal heat capacity. The technology is based on an advanced implementation of the JEDEC static test method (JEDEC JESD51-1) and compliant with others incl. JEDEC JESD 51-14. 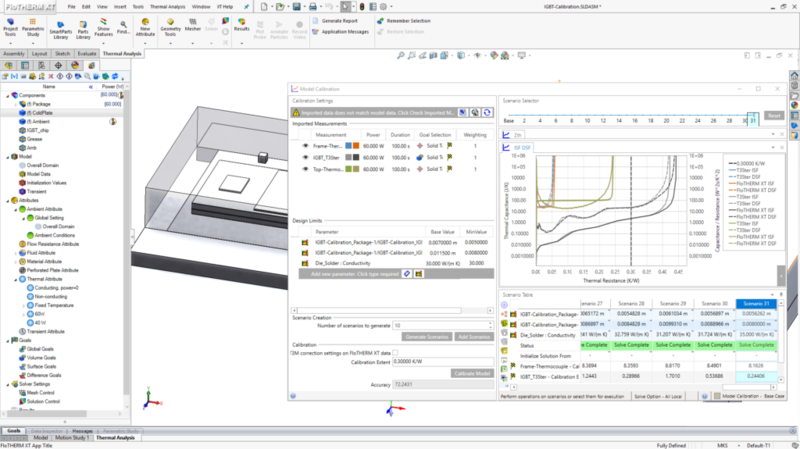 Incorporating accurate transient measurement data and structure functions from Simcenter T3STER into simulation for calibration purposes is now easier and faster using automation and optimization capabilities available in both Simcenter Flotherm, and also Simcenter Flotherm XT, the CAD centric electronics cooling software within the product family. In Simcenter Flotherm and Simcenter Flotherm XT, an initial component model is used to generate a structure function from junction temperature transient simulation results. Structure functions help identify areas of inconsistency between the assigned model input values and measurement based results. The automatic calibration procedure changes model inputs until the simulated structure function matches the imported Simcenter T3STER measurement based structure function. Once the structure function match is achieved, a model is fully calibrated and will respond correctly and accurately to different transient modeling scenarios. 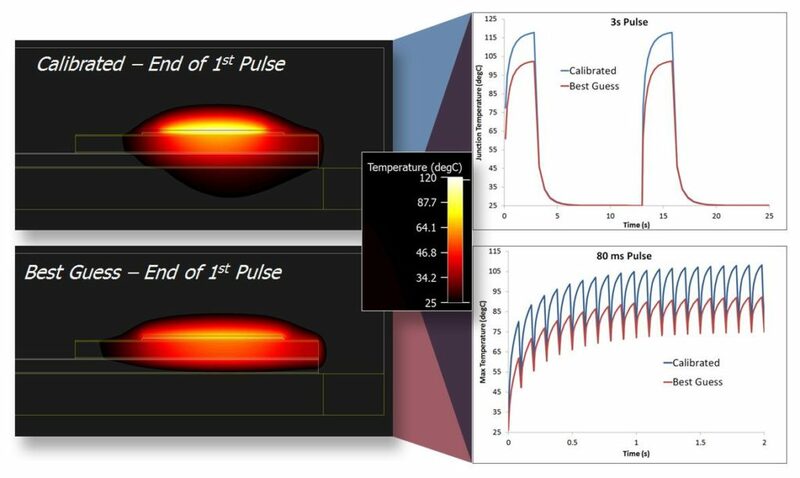 The primary benefits to engineering departments responsible for reliable electronics product thermal design is that a model for higher accuracy in both steady state and transient modeling is produced far more easily and quickly. An accurate model helps to improve and optimize design for critical operating points. An accurate transient model is particularly useful for reliability oriented thermal studies as it improves prediction of influencing factors such as peak temperatures, temperature gradients, and temperature cycling vs time. A fully calibrated package model will respond correctly to transient pulses, a unique differentiating capability. 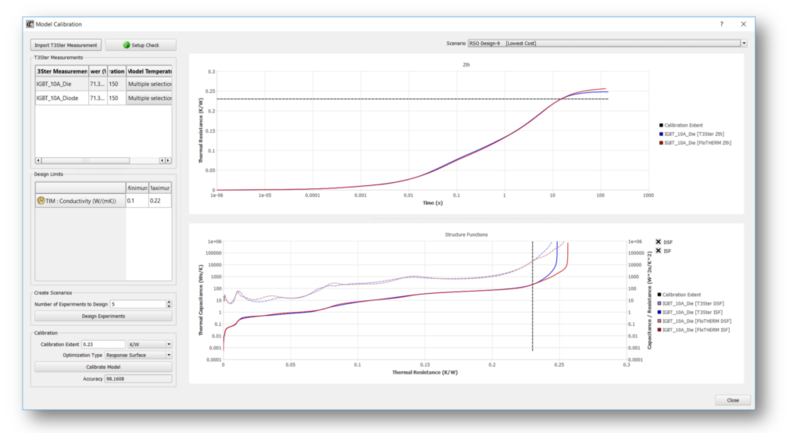 This test and simulation solution also supports supply chain value in in that semiconductor firms can provide test proven simulation models to system integrators that will respond correctly to any driving power profile. System integrators can then design products with increased confidence in performance. The automatic calibration procedure replaces tedious, time consuming and error prone processes associated with traditional manual calibration. Alternative test methods do not provide the level of proven accuracy as Simcenter T3STER does for thermal characterization and Structure Function generation. Typical manual calibration methods also require engineering experience and extensive time for iterative simulation studies. “The new Simcenter Flotherm XT product with automated model calibration will maximize simulation accuracy for reliable product performance. We are excited to provide this new Simcenter Flotherm XT solution to our customers, particularly for high-performance products targeting consumer electronics, automotive and mil-aero markets,” stated Jay Chien, General Manager, EFD Corporation. This unique integrated solution provides a clear advantage to the customer. 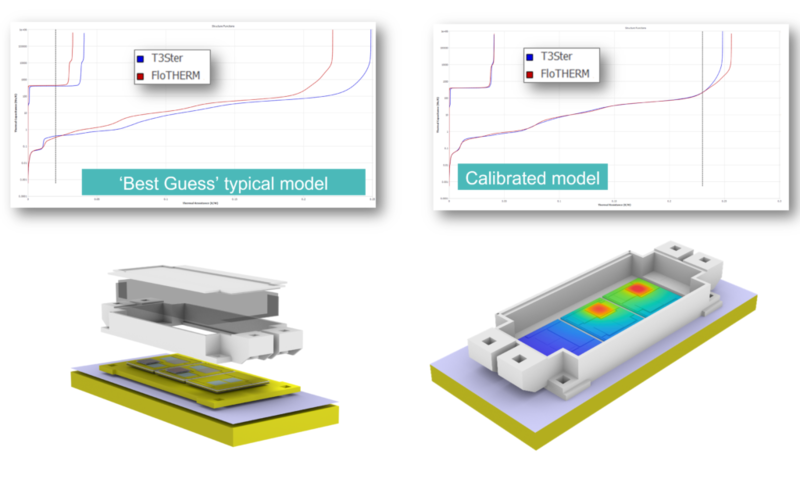 The combined test and simulation solution of Simcenter T3STER with Simcenter Flotherm or Simcenter Flotherm XT provides an automated method to calibrate component simulation models to match transient thermal measurements data, so thereafter models can be used in design with high confidence as to their accuracy. The accuracy can exceed 99%, realizing at least an order of magnitude reduction in the modeling error. This allows engineers to develop products with far more confidence to reduce size, weight, cost and in particular cases, power consumption, of their designs.